Infinity scarves are really trendy and a great way to accessorize, but at upwards of $10 each, they can get expensive. 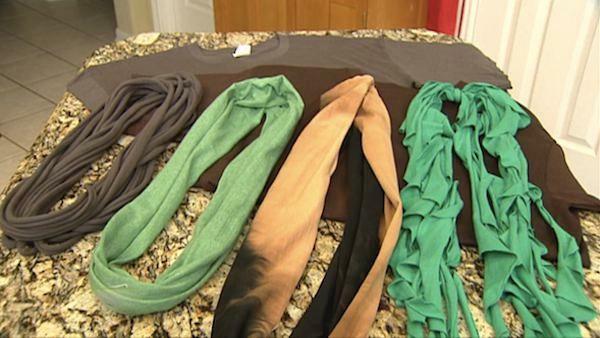 Here's how you can make your own cute scarves at home for pennies, or even for free, out of old t-shirts. Blogger Nora Kapche shows us how to make these classic scarves using just a t-shirt and scissors! You can choose any color t-shirt you like, but the size of the shirt matters. If you want to be able to double the scarf around your neck, you'll need a large or extra-large shirt. Lay the t-shirt flat on an even surface. Cut under the shoulders and the bottom seam. You do not have to cut straight lines. Now, take the shirt and pull in a circular motion making it bigger and rolling the edges. If you want personalize it, you can add flowers, rhinestones or pins. Pour equal parts of water and bleach into a bowl. Take the t-shirt and soak the bottom half in the bowl. Let the t-shirt sit until the color lightens then gradually put more into the solution for lesser amount of time creating the ombre effect. You want to soak the shirt for about 10 to 15 minutes depending on the color you want to achieve. After that, dry the shirt in the dryer. Once it is dry you can follow the same process as making the classic infinity scarf. Now you have an ombre infinity scarf. Lay the t-shirt flat on an even surface. Cut the shoulders and the bottom seam. Then cut the remaining t-shirt in 2 inch sections. Gather each one and pull to stretch them out. Cut a piece of fabric from the original shirt, like from one of the sleeves, and tie it around all of the ropes to keep all of them together. Lay the t-shirt flat on an even surface. Using the sharpie, trace the plate. Repeat this step until there is no more space to fill. To make the most of your materials, make the circles as close as possible. Cut out the circles. Then cut spirals in a circular pattern. You can draw the spiral pattern on the circle or just free-hand it. To create the ruffle, run your hand down each piece. Now, divide the pieces in half and bring the ends together. Use a piece of the shirt, like from the sleeve, to tie them together. Depending on how many layers of ruffles you want, you can cut more circles.